To create a thriving world we most change our story and relationship with economics. In a generative economy, wealth is not measured by the accumulation of stuff and power, but instead by the creation of patterns that generate well-being for people, communities and nature. In the current economy, money is our fundamental mechanism of trade and holder of stuff and power. In the next economy currencies become the universal medium for communities to generate well-being together, to create abundance and flows of resources that have the potential to solve some of our most challenging problems in full honor of ALL life. Join us in a journey towards the creation of a new story for a Thriving Planet and understand the potentials for community currencies to shape the most beautiful world our hearts knows is possible. Reboot: "to start over." To start over is to clear what is not working, in order to operate from a new place. The TimeCoop community is full of energy, visions and ideas. In our 'Vision Cafe' dreams and ideas became visible, challenges and places where we are stuck were named and now its time for 'me' to invest myself for 'US' to leap forward. 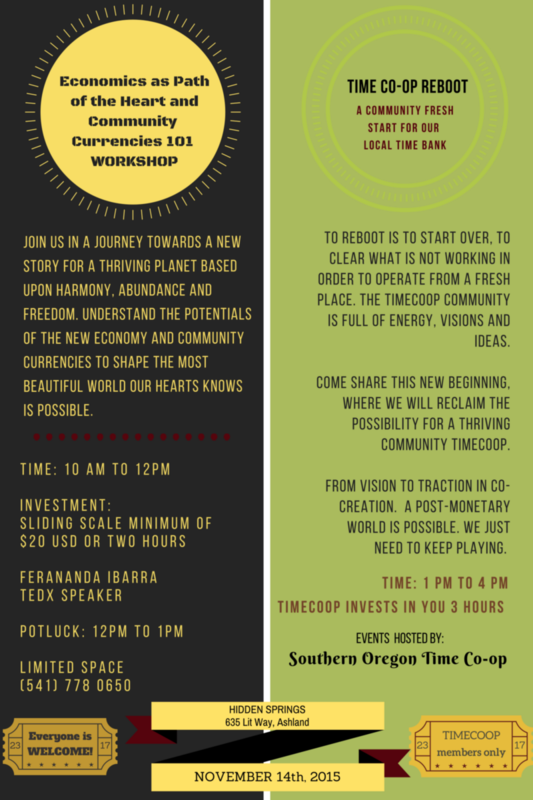 Come share this new beginning, where we will reclaim the possibility for a thriving community TimeCoop. From Vision to Traction in Co-Creation. A post-monetary world is possible. We just need to keep playing.